4.1 "Changing of the guard"
5 Democratic Socialists of America member? Gerald McEntee is the Presidentof the American Federation of State, County and Municipal Employees (AFSCME). He is one of the co-founders for the Economic Policy Institute and served on the Presidential Advisory Commission on Quality and Consumer Protection in the Health Care Industry during the Clinton presidency. In May 1986, Democratic Socialists of America "supported" a New Directions conference in the Washington DC Convention Center. Conference organizer was Jo-Ann Mort of DSA. The conference, supported by DSA, will bring together activists, analysts and elected officials to develop new directions for the Democratic Party and the broad democratic left. Initial sponsors of the event included Reps. Charles Hayes and Barney Frank, labor leaders William Winpisinger and Jack Sheinkman (ACTWU), Joyce Miller (ACTWU and CLUW) and Jack Joyce, (Bricklayers), feminist leaders Gloria Steinem and Judy Goldsmith and policy analysts Robert Kuttner, Jeff Faux and Eleanor Holmes Norton. Gerald McEntee addressed the conference. In the keynote of the 1991 Democratic Socialists of America Health Care Speakers Tour, Audrey McLaughlin, Leader of the New Democratic Party, met with members of Congress, trade unionists, and media in Washington, D.C. Democratic Socialists of America, AFSCME, and the American Solidarity Campaign organized a Congressional breakfast, press luncheon and labor reception for McLaughlin. They also set up meetings with House Majority Whip David Bonior, Congressman Marty Russo, UMWA President Richard Trumka, and AFSCME President Gerald McEntee. In 1996 Gerald McEntee, AFSCME was one of the original 130 founders of Campaign for America's Future. "Im reminded of Jeremy Brecher's article A New Labor Movement in the Shell of the Old in which he raised some critical issues regarding the need to transform the culture of unions and the Federation when John Sweeney became elected President. I have the utmost respect and admiration for brother Sweeney and his leadership team, Linda Chavez-Thompson and Richard Trumka. AFSCMEs role, and more specifically Gerry McEntee's leadership, was instrumental in the changing of the guard. Democratic Socialists of America member? 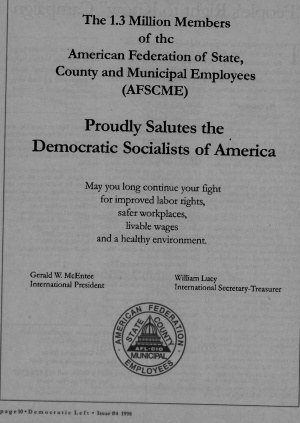 AFSCME International President Gerald McEntee and International Secretary/Treasure William Lucy placed an advertisement in Democratic Socialists of America's Democratic Left, Issue #4 1998, page 10, "AFSCME proudly salutes Democratic Socialists of America"
On April 26, 2012, at the AFL-CIO headquarters in Washington, D.C., Asian Pacific American Labor Alliance members and supporters celebrated the group’s 20 years of addressing the workplace affecting the 660,000 APA union members and as the bridge between the broader labor movement and the APA community. The 20th anniversary ceremonies also honored AFSCME President Gerald McEntee, Rep. Judy Chu (D-Calif.) and the group’s first director Matt Finucane for their important roles in APALA’s founding and growth. Chu, the chair of the Congressional Asian Pacific American Caucus—and a longtime activist in her union, AFT—was elected to Congress in 2009. She is a strong supporter of APALA and its work, said APALA leader Gregory Cendana. Finucane, now NEA’s senior liaison to the Asian American and Pacific Islander community, was instrumental in building APALA’s organizing, political and advocacy programs. Gerald McEntee serveson the Board of Directors of the Economic Policy Institute-led by Democratic Socialists of America member Lawrence Mishel. In 2009 Gerald McEntee was listed as a member of the Advisory Board of Wellstone Action, a Minnesota based organization based on the political legacy of that state’s late ‘progressive” Senator Paul Wellstone. Individuals and organizations supporting The 99% Spring, as of April 20, 2012, included Gerald W. McEntee - AFSCME . This page was last modified on 14 January 2016, at 13:02.